The first time I experienced a Poke bowl was on the big island of Hawaii, during a brief escape from the November Vancouver rain (you can come too, next time!). Despite being a sushi fan, the concept of a bunch of raw fish on rice seemed odd, but I enjoy sashimi and got over it really quickly. 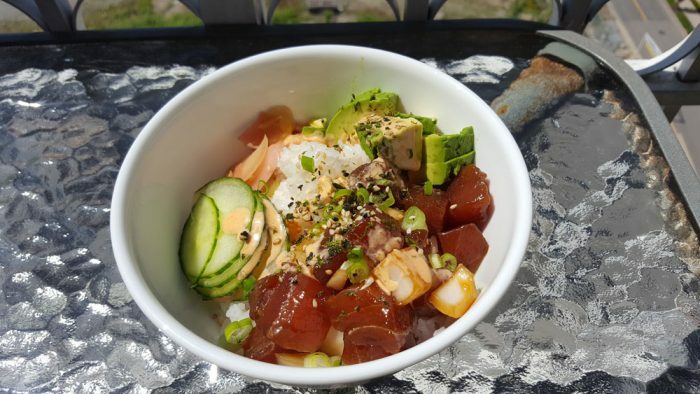 If you love North American style sushi, you’ll love a poke bowl. The first version I tried was very simple, marinated sushi grade fish on rice, brown or white…and maybe a bit of seaweed salad on the side, in a plain little take away box, handed to me over a nondescript freezer / counter in the back of a grungy little Hawaiian grocery store (and I don’t mean grungy in a bad way, it just wasn’t fancy and pretentious). 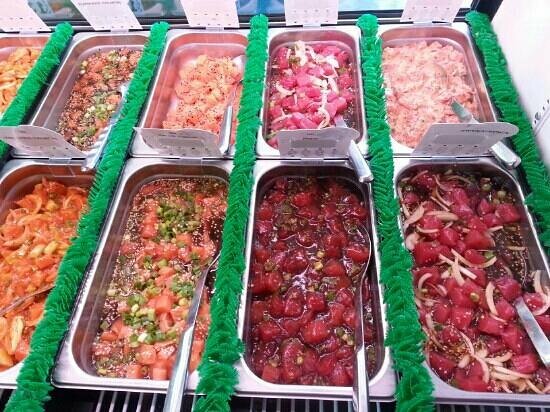 Hawaiians may not have a million types of toppings, but they do offer some tasty ways to eat raw seafood. Poke bowls have since evolved to suit our North American tastes (we like our food big, bold and with all sorts of odd jazz on it, like our pizzas, poutine, sushi and burgers). 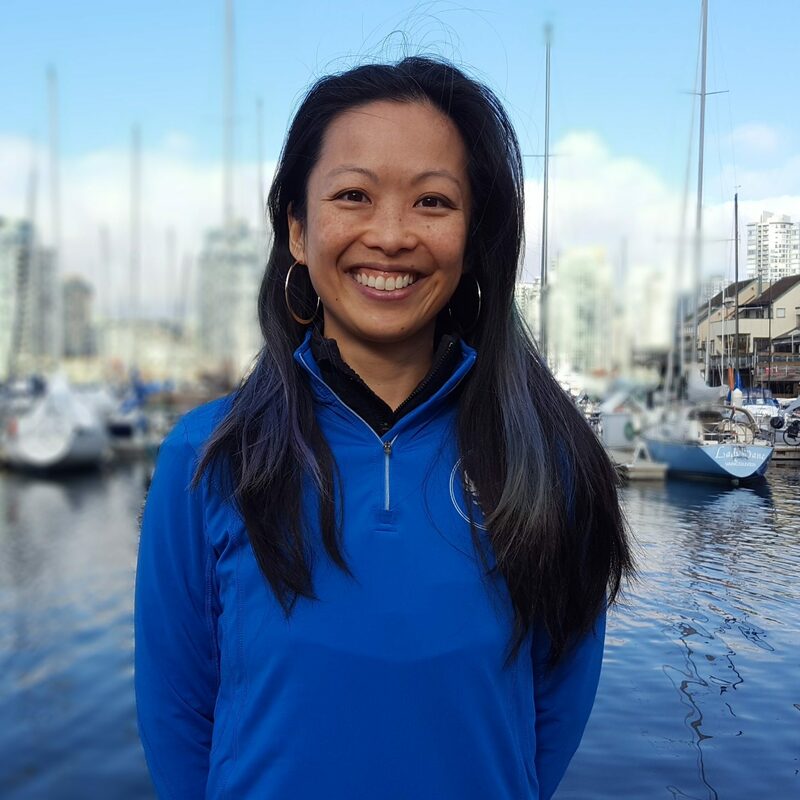 Vancouver has had a recent explosion of poke bowl places pop up, but the best bowl I’ve ever had, surprisingly, is Moby’s Pub on Saltspring Island. This poke bowl recipe is a blend of complex and simple, only 4 main ingredients and delicious as heck. Everything else you want to throw on there is listed as optional below, but even without, it’s still amazing! My husband hates onions, but didn’t notice them in the marinade – choose the flatter, squat shaped sweet onion and keep the chunks large for two reasons (1) it’s easier to separate them out and (2) less cell wall damage keeps the sulfur-y component of the onions out of the flavouring. A really sharp knife is key, as well. Call around and ask your local seafood shop if they are currently carrying sushi-grade seafood. You can use scallops, shrimp, ahi tuna, salmon…go nuts, but just don’t use any old “previously frozen sockeye” fillet from the grocery store. I’ve found F.I.S.H. Market always has a good supply, as does Seafood City on Granville Island. Assembly time: 1 minute if you’re hungry, 7 minutes if you like a good presentation. Cube your sashimi grade fish into ½ inch bites and marinate in soy sauce with sweet onions. Set aside in your fridge for a minimum of 2 hours, and up to 2 days. Add any of the above optional ingredients and enjoy! To make Sriracha or wasabi mayo, simply mix 2 tablespoons of mayonnaise with 1 teaspoon sriracha (or wasabi) and adjust to your liking. Add 1 tablespoon of water. You may want to add ¼-½ teaspoon of sugar to take the edge off, but this is a personal taste choice. Grab some friends, a refreshing drink (a mai tai is perfect if you want to keep the Hawaiian theme going) and a spot in the sunshine, then enjoy your delicious and easy meal!